Eugenia Ravasco was born on 4 January 1845 in Milan, Italy, the third of Francesco Matteo and Carolina Mozzoni Frosconi's six children. When she was three years old her mother died and her father moved to Genoa where his two brothers lived, taking with him his eldest son, Ambrose, and the youngest daughter, Elisa. Eugenia remained in Milan with her Aunt Marietta Anselmi, who became a second mother to her and carefully educated her in the faith. In 1852, the family was reunited in Genoa and following her father's death in March 1855, Eugenia went to live for some time with her uncle Luigi Ravasco and her aunt Elisa and their 10 children. Luigi Ravasco was careful to give his nephews and nieces a Christian upbringing. He was well aware of the anticlericalism on the rise in Italy at the time and of the efforts of the Freemasons, and was especially worried about Eugenia's brother, Ambrose, who had come under the influence of this spreading problem. From early adolescence, Eugenia was deeply influenced by her uncle's responsible Christian example and his generosity towards the poor. Unlike her shy younger sister, Elisa, Eugenia was expansive and energetic and loved to serve others. Eucharistic worship, together with devotion to the Sacred Hearts of Jesus and Mary, became an essential part of her spirituality. On 21 June 1855, Eugenia made her First Communion and Confirmation in St Ambrose's Church and from that day on, whenever she passed a church she would enter it to pray. God was preparing her for greater things. Although her aunt wanted her to marry, Eugenia prayed that the Lord would show her the path to take, since she felt a growing inner call to religious life. On 31 May 1863 she received an answer as she entered the Church of St Sabina to pray. Fr Giacinto Bianchi, an ardent missionary of the Sacred Heart, was celebrating Mass. When she heard him say to the faithful, "Is there no one out there who feels called to dedicate themselves to doing good for love of the Heart of Jesus? ", Eugenia understood that God was speaking to her, calling her to him through the Sacred Heart of Jesus. As time went on, Eugenia felt that God was calling her to found a religious order that would form "honest citizens in society and saints in Heaven". Other young women had also joined her in this effort. On 6 December 1868, when she was 23 years old, she founded the religious congregation of the Sisters of the Sacred Hearts of Jesus and Mary. Canon (later Archbishop) Magnasco had prepared her carefully and she continued, together with the sisters, to teach catechism and to open schools. Despite open hostility towards the Church and the activity of the Freemasons, Mother Eugenia opened in 1878 a school for girls to give them Christian instruction and to prepare "Christian teachers" for the future. She proved courageous in the face of the persecution and ridicule she received from the local press. She also gave particular attention to the dying, the imprisoned and those away from the Church. Notwithstanding her poor health, she travelled around Italy and to France and Switzerland, opening new communities and attracting religious vocations. In 1882 the Congregation received diocesan approval and in 1884, together with her sisters, Mother Eugenia made her perpetual profession. She guided the foundations and her sisters with love and prudence, giving them as model the Sacred Hearts of Jesus and Mary. Her apostolic ideal in life was "to burn with the desire to do good to others, especially to youth", and to "live in abbandonment to God and in the hands of Mary Immaculate". 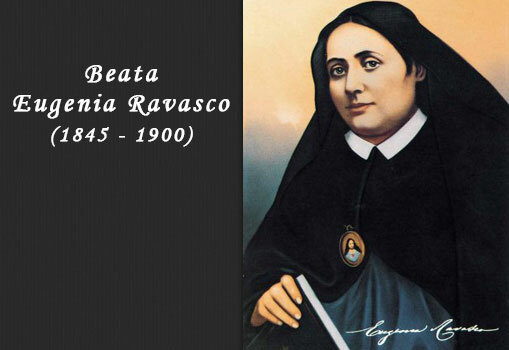 Mother Eugenia Ravasco died on 30 December 1900 in Genoa, consumed by illness. And in 1909 the Congregation she founded received Pontifical approval. Today the Congregation of the Sisters of the Sacred Hearts of Jesus and Mary (also known as the "Ravasco Institute") are present in Albania, Italy, Switzerland, Argentina, Bolivia, Chile, Colombia, Mexico, Paraguay, Venezuela, Africa and the Philippines. They continue their work in schools, parishes and missions and are especially dedicated to serving youth and the needy and to promoting the dignity of women.